Les Miserables Trailer: Anne Hathaway wows in the newly released trailer for the upcoming movie musical. Yesterday, the teaser trailer for the highly anticipated film version of the hit musical Les Miserables was released. 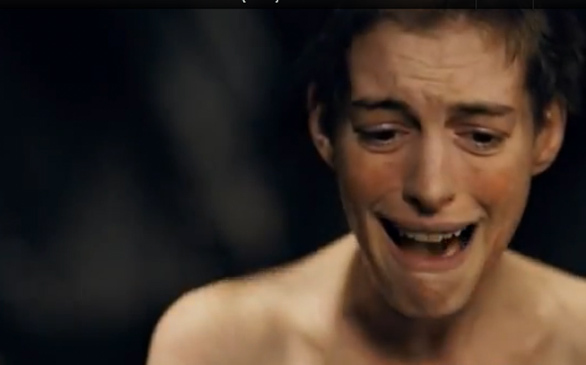 The minute-and-a-half trailer features Anne Hathaway, who portrays Fantine, emotionally performs one of the most famous numbers from the musical, "I Dreamed a Dream". In the short teaser, it's already quite apparent that Hathaway went all out for her role, for which she shaved her head. There will no doubt be Oscar buzz for Hathaway by the time next year roles around. The film features an all-star cast, with such big names as Hugh Jackman, Russell Crowe, Amanda Seyfried, Helena Bonham Carter, and Sacha Baron Cohen. Les Miserables will be released to theaters on December 14, 2012.